Music Therapy is a powerful medium which helps children who may struggle to express themselves. 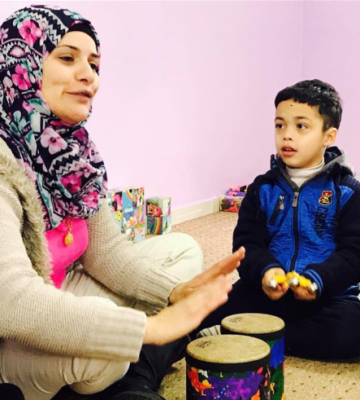 This project was initiated in 2015 by ABCD Trustee and Music Therapist, Canon Claire Tillotson, in conjunction with Paediatric Psychiatrist Dr Souha Shehadeh, who leads the Bethlehem Arab Society for Rehabilitation (BASR) Mental Health Team. These projects are run in conjunction with Guildhall School of Music and Drama and the Mental Health Team at BASR. 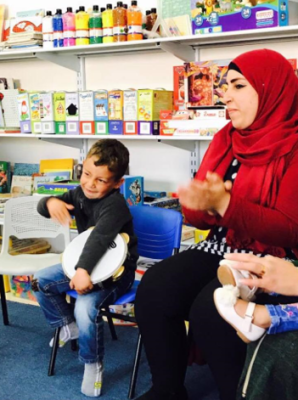 We aim to bring this therapy to the Refugee Camps, and to deliver two, rather than one, ten week Music Therapy projects a year. Every Tuesday morning Badir’s mother knows that he will tell her he has ‘music with Raniya’. Eight months ago, Badir, a seven and-a-half-year-old boy on the autistic spectrum who lives in El Khader, near Bethlehem, was disruptive in school. Unable to sustain attention, restless and agitated, and unlikely to use the little language he did have in social situations, he struggled in school. 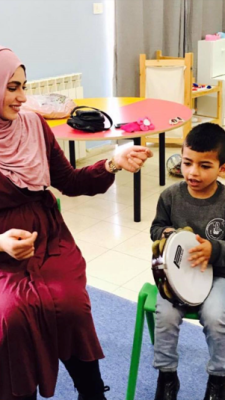 Over the course of these months Badir has benefitted from weekly music sessions with Raniya, BASR’s music facilitator whose salary ABCD supports. Together with these sessions, the therapeutic play activities with the BASR mental health team and regular meetings to discuss his progress, his programme is adapted to reflect his progress. Now he is able to use words to express his needs. He is more aware of people around him, and that they are different from him. He is progressing in his abilities to wait, to listen, to have eye contact, and in his way of expressing different emotions like sadness, anger and joy. Badir’s eagerness and response to music sessions with Raniya reflects his awareness of the wider world and his place in it. His story is one of many showing the incredible power of music therapy.